Secure Texting Is Now Cheap and Easy. Time to Stop Using SMS. If you haven’t recently looked at what secure texting apps are available, now is a good time to take a moment and do that. We here at Person Centered Tech are pleased that the availability of low cost or free, secure, therapist-friendly texting apps has skyrocketed. Combined with the proliferation of smartphones throughout the developed world, this means there is a critical mass around secure texting that makes it easily available to us mental health private practitioners and our clients. 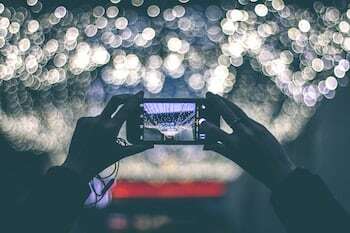 Read on to learn why we recommend that outside of certain exceptions, clinicians cease using “classic texting” methods with clients and focus on using only secure ones. “Classic texting” is how we refer to the texting that comes with our phones and/or phone plans. It’s usually a thing called SMS (or sometimes MMS.) Unmodified Android phones use SMS for all their texting. For iPhone and iPad users, SMS is what you’re using when your text messages are colored green. Speaking of iPhones and iPads: our definition of “classic texting” includes iMessage, which is what you’re using when your messages turn blue. The secure texting methods listed below should more than suffice as a replacement for iMessage in nearly 100% of cases, though. In short, we recommend you start planning a transition away from using iMessage completely. 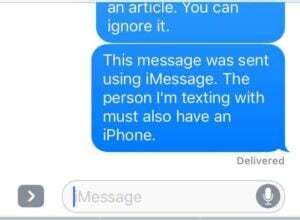 A picture of an iPhone screen when sending a message using Apple’s iMessage. As we’ve said before, “Standards for Technology = Available Technology + Real World Environment.” Secure texting is now too easy and cheap to do to continue justifying the use of classic, HIPAA-unfriendly texting methods (with the notable exceptions listed below). Therapist and client both possess smartphones. Therapist and client both use the same secure texting app. When it comes to finding a secure texting app, there are many choices now on the market, some free and some cheap. Person Centered Tech provides reviews to help guide clinicians in making such choices. Those who follow us probably already know about Signal, the free and open source secure texting app. Signal comes with our recommendation in cases where it is a good match for your practice. Please read our full review of Signal (which is open to the public!) before using it. Use of Signal requires some procedural planning on your part, and group practices may or may not find it suits their risk management culture. When the match is good, however, it’s an excellent choice. As much as we all love free, please don’t stop your search there. A number of paid secure texting apps that supply HIPAA Business Associate Agreements exist on the market. Many of them come with additional features which may make them worth the cost to your practice. Of particular interest are secure email services that provide a mobile app, and the ever-increasing number of practice management systems that supply mobile apps with secure messaging included. Private practice marketing experts have been advising therapists for a couple years now to include texting as an option for initial contact. Regardless of the potential security risks in this method, it’s sound marketing advice. Secure texting has the disadvantage of not supporting one-click contact the way SMS texting does (you can set up a link on your mobile-friendly web site that opens up a new SMS text message when clicked.) Most secure texting apps would need to be downloaded by the potential client before they can use it to converse with you. Of course, the reality is that most potential clients don’t pay attention to whether or not the contact method is secure. 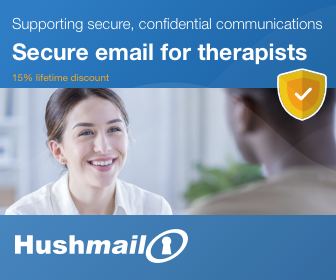 But we wonder what would happen if the majority of therapists encouraged secure communication methods on their websites, and took some time to explain to both clients and colleagues how these software choices are the cyberspace equivalent of using soundproof doors and white noise machines in our offices. Secure initial contact through your website can always be done using secure forms. It’s another cheap and easy way to add security to the services you offer clients. Below is a link to our reviews of products that allow you to set up pages where clients can securely send you messages and even file attachments. Not everyone is a fan of smartphones! There is clinical value in using texting with a particular client at a particular time. SMS is the only type of texting that can be used in the situation, due to lack of smartphone or another reason. The security risks posed to the client by SMS texting are low enough to be acceptable. There is a ton of research out there on the effectiveness of text messaging as part of addictions treatment. In nearly all those studies, SMS texting was used to deliver the intervention. Can’t they replace SMS with a secure texting app? Not in these cases. Because they either used government-supplied phones which don’t support smartphone apps, or the researchers used an automated texting system that can only do SMS. Another time when SMS might work is when the client simply chooses not to own a smartphone, and SMS messaging with the therapist makes sense clinically and in terms of risk management. For the typical private practitioner, the most common reason to keep using SMS will likely be in automated appointment reminders. In these cases, clinicians should be using a HIPAA-friendly service — meaning one that comes with a Business Associate Agreement — that allows clients to opt in to receiving SMS reminders of upcoming appointments. 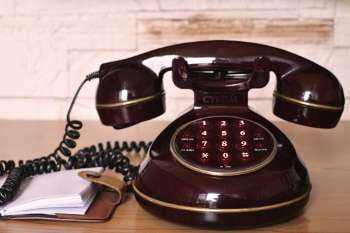 The modern world of too-many-ways-to-contact-someone strongly necessitates the use of communications policies with clients. Along with the policy, we encourage a discussion of expectations around between-session contact with the therapist. We provide a Sample Communications Policy to our free newsletter subscribers, and discuss the topic in our core course series. Be careful of the subtle differences between texting as a way to communicate administrative issues like appointment changes, and as a medium for performing telemental health. Without well-established policies around communication, it can be easy to slip into the latter. Getting clients onboard with your secure communication methods often hinges on your own familiarity and comfort with the tech. We discussed this in more detail in our article on sticking to secure communications. We don’t know about you, dear readers, but we’re pretty excited at yet another aspect of our professional lives being well-served by secure and reliable software products. We hope you take advantage of them. Hello, I have been a subscriber for over a year, however do not recall getting you whole collection of mental health pp form, and consent forms for email and texting. I wondered if you would be willing to email these again? I really appreciate all of your invaluable information and hopeful I can join and take CEU courses this year. Thank You! Thanks for the kind feedback; we’re so glad you’ve found the information and resources we provide to be helpful. As a subscriber to the free newsletter, all of the forms we provide are available to you for download on your “my free downloads” tab under your “my account” page when logged into our website. You can go directly to that page by clicking here Please let me know if you have any difficulty accessing those and I’ll be glad to be of help. If you’re considering joining as a member of our Person Centered Tech Support service and learning more about all the features and resources it includes, or would just like direction to our resources that address your specific questions, I invite you to schedule a free resource consultation with me (I’m the Deputy Director.) You can schedule that directly here; or call 503-893-9717 or email liath@personcenteredtech.com.